Do you want to gain confidence in working online? Are you a parent wanting to know more about the digital environment for your children? Clients include The Church of England, The Methodist Church, United Reformed Church, Girlguiding, Organisational Development in Higher Education Group, The National Archives, and a range of voluntary and Christian organisations, and Universities. Read what some of them have to say. Dr Bex Lewis is a ‘DigiExplorer’, an experimenter in the digital spaces, with a background as a cultural communications historian whose PhD explored wartime propaganda. In recent years she has provided the definitive history of “Keep Calm and Carry On”, quoted in a range of publications, including the New York Times, Independent and Daily Mail. Bex has over 19 years of experience in the digital environment, having built her first website for her PhD in 1997, been involved in usability and accessibility projects, and is an early adopter of social media tools. Bex has a particular interest in giving users the confidence to use social media for themselves, to see the possibilities, and to set them on the path with a mix of theoretical and practical advice and encouragement. Moving on from website development, she created her first blog in 2007 whilst travelling around the world. 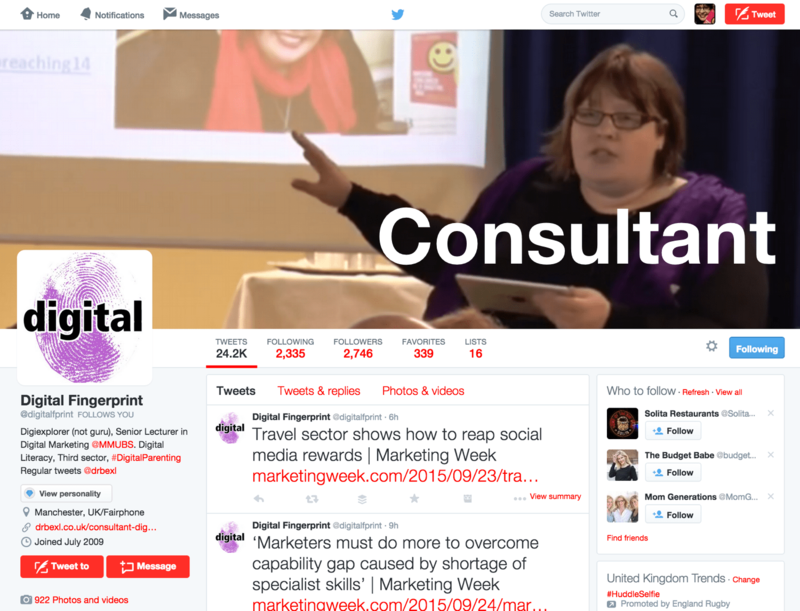 She is now Senior Lecturer in Digital Marketing at Manchester Metropolitan University, but continues to open to writing commissions and occasional speaking engagements through Digital Fingerprint. Until 2015 she was Research Fellow in Social Media and Online Learning (0.8) for CODEC at the Durham University, where she was Director of The BIGBible Project (shortlisted for The Jerusalem Trust Awards in 2013 and 2014). She remains passionate about helping everyone, especially Christians, to be a positive presence in the digital environment . She created the concept of the #digidisciple: ‘what does it mean to live a life of faith in the digital age’. She is a member of the Network for New Media, Religion and Digital Culture Studies, The MediaNet, New Media Centre for Excellence, the social media working group for the Evangelical Alliance, and submits regular reviews to The Journal of Religion, Media and Digital Culture. Formerly Senior Fellow in Technology Enhanced Learning and Teaching (0.5) at the University of Winchester, she taught the Blended Learning module on the PGCLTHE, and an innovative media studies module specifically built around Web 2.0 tools. She was involved in JISC- funded BODGIT, ODHE and FASTECH projects, with a particular focus on change management, student skills, and digital literacies. Dr Lewis completed her PGCLTHE and became a Fellow of the Higher Education Academy in 2011.
that for change to be effective it… must be a participative and collaborative process that involves all those concerned. If contacting with regards to an invitation for speaking, writing or workshops, please indicate fee/expenses available.